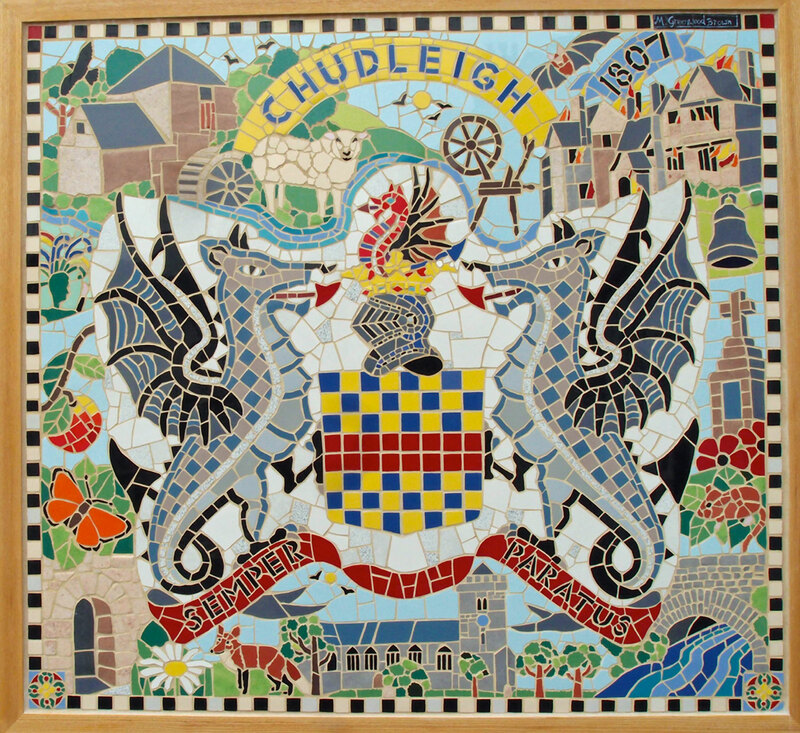 Mounted on the gable wall of 5 Fore Street, the Chudleigh Mosaic was commissioned following an idea that arose during a meeting of Chudleigh & District Amenity Society in 2014. 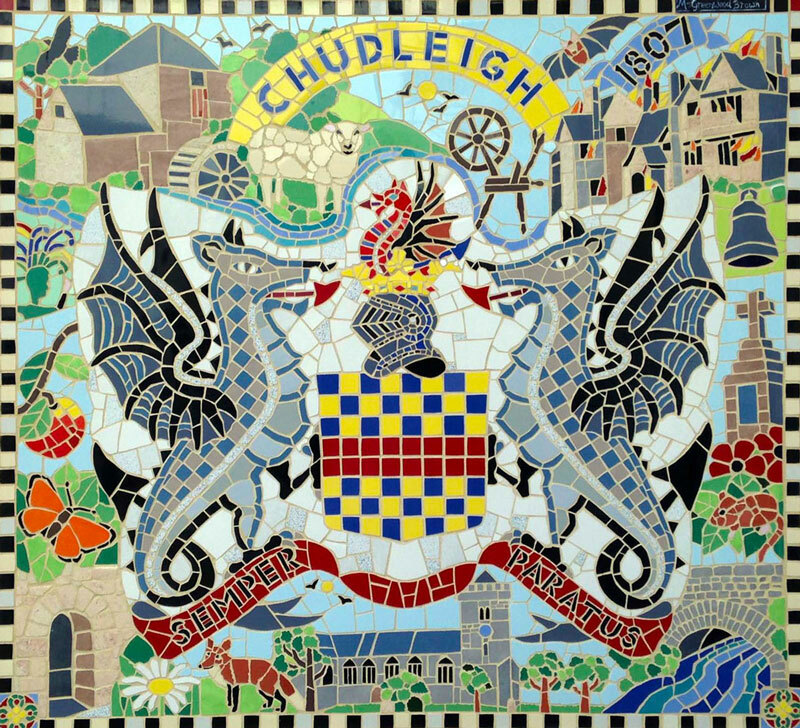 Michelle Greenwood-Brown, creator of the Chudleigh Mosaic, is a well-known and respected local mosaic artist. Central to the mosaic, is the Coat of Arms of Lord Clifford of Ugbrooke. 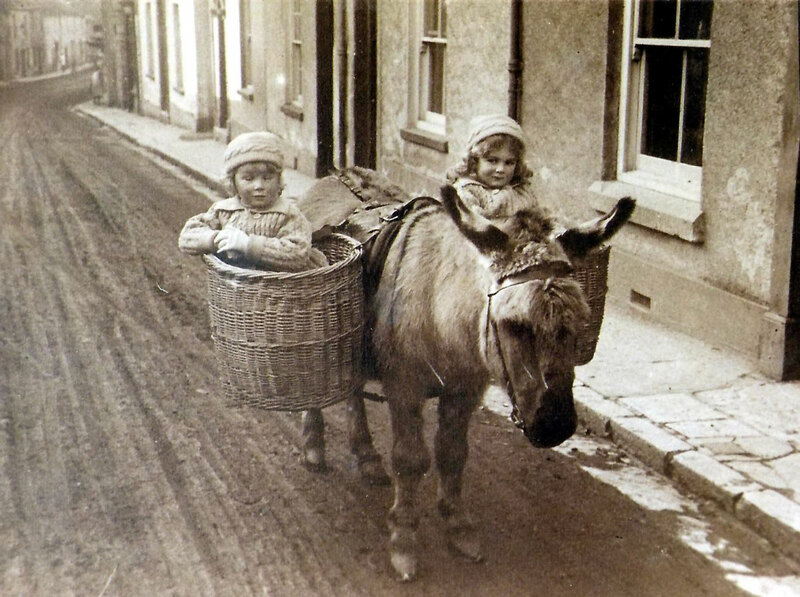 The Clifford family have been major supporters of Chudleigh, dating back many hundreds of years. The Coat of Arms depicts two wyverns (mythical creatures) supporting an armorial shield with a baronial crown mounted on a helmet. The motto Semper Paratus is a Latin phrase, meaning “Always ready”. Butterflies, flowers and fox representing the varied flora and fauna of our area. Cider apple representing the small but important part that cider played in our local economy. The head of the Dancing Queen, which represents the oldest and most significant cultural entertainment in Chudleigh’s calendar, namely, The Chudleigh Carnival. The Chudleigh leat, which is a water supply taken from the Kate Brook at Hams Barton, and diverted to serve the water wheel at the rear of Town Mills in Clifford Street. A bird to represent all the local birds, which include Peregrine Falcons and Buzzards. Pipistrelle bats, and the more significant and rare colony of Greater Horseshoe bats. The Ewe and spinning wheel record the important part that wool and weaving played in the economy of Chudleigh in past years. 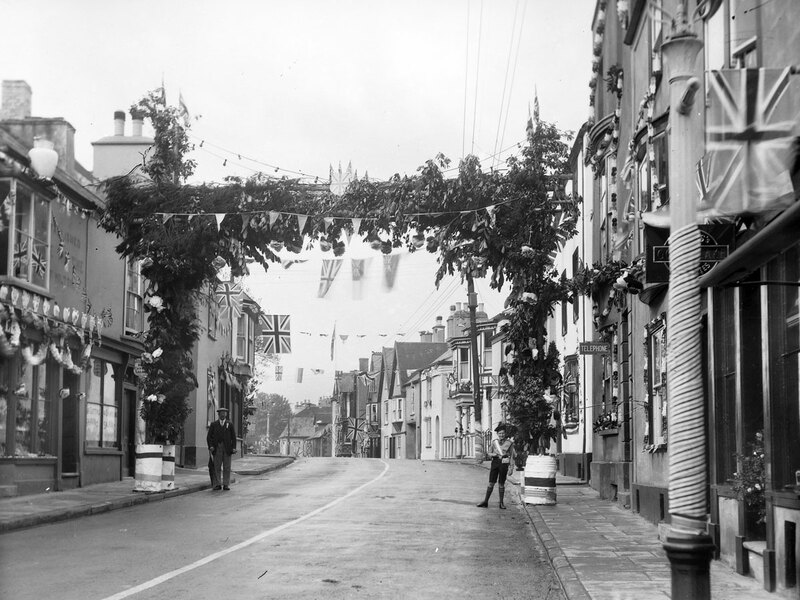 Chudleigh was designated a ‘Wool Town’, and granted a charter in 1309 by King Edward II for a weekly market and annual fair. The Great Fire of Chudleigh in 1807. This significant event caused the formation of The West of England Fire and Life lnsurance Company. Today, after many, many takeovers, this company is known as Aviva .. one of the largest insurance companies in Great Britain. The bell represents the two bells on display in the Town Hall. They were found in the Old School and the Old Town Hall. The War Memorial commemorating the fallen residents who served in WW1 and WW2. This is a Listed Monument following the intervention of Chudleigh & District Amenity Society in 2015. A dormouse .. Chudleigh has a large & significant colony. The bridge over Kate Brook in Clifford Street .. it dates to 1681. The two great oak trees in Shearers Way, saved from developers by the efforts of Chudleigh History Group and Chudleigh & District Amenity Society, and Chudleigh Town Council. The Church of St Mary and St Martin that has origins dating back to the 1300’s.